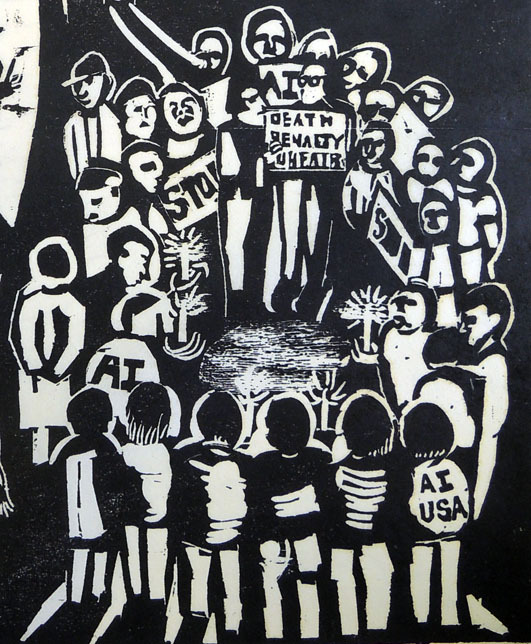 Eric Avery, USA Dishonor and Disrespect (Haitian Interdiction 1981-1994), 1991. Linoleum block print on a seven-color lithograph printed on mold made Okawara paper. 46½ x 34 inches. Edition: 30. Graphic Arts Collection 2014- in process. 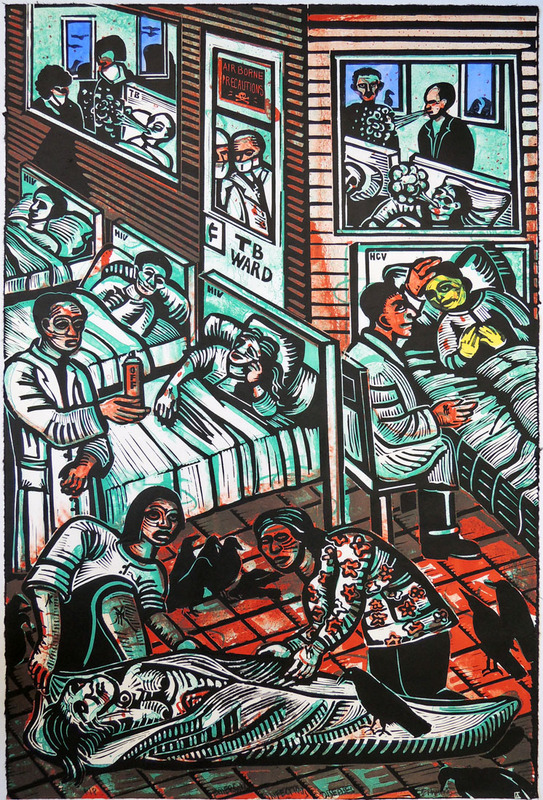 We are delighted to have several new prints and artists books in the Graphic Arts Collection by Eric Avery, a Texas physician/artist who moved to New Hope in 2013 after retiring from working as a psychiatrist in a large HIV/AIDS clinic for twenty years. Doctor Avery has made a career incorporating his medical practice with his activist art, delving into such themes as infectious diseases, human rights abuse, and the death penalty, among others. 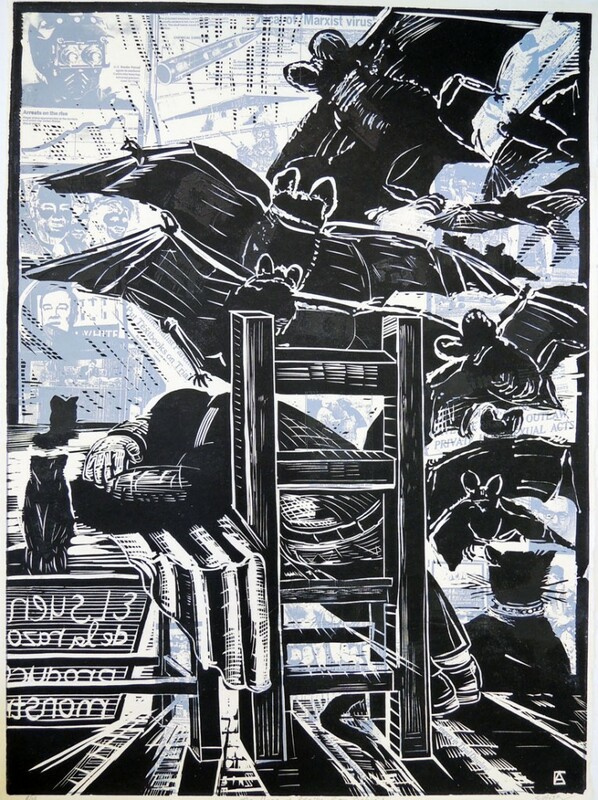 Many of his complex prints appropriate one or more iconic art historical images into contemporary events. Here are a few examples now at Princeton University. 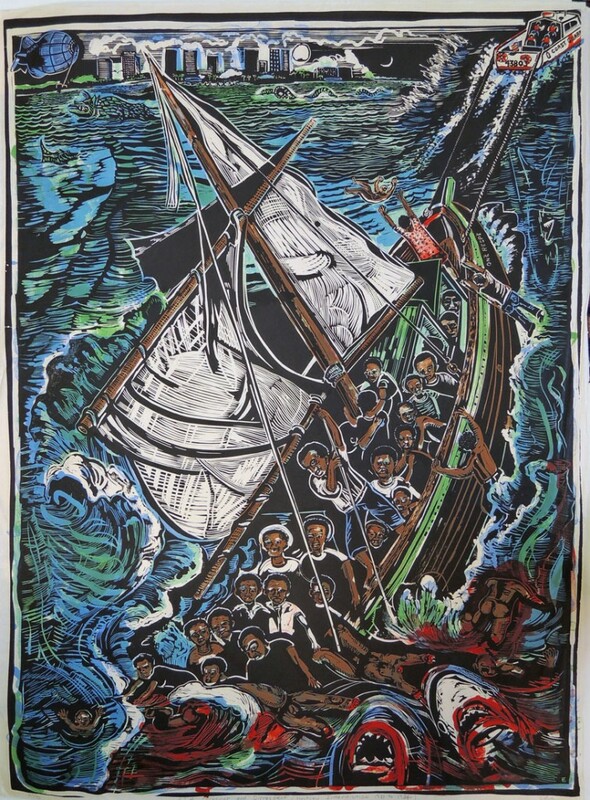 Published by the Tamarind Institute, Avery’s complex linocut [above] incorporates the facts of the 1990 tragedy with three separate art historical paintings: Theodore Gericault’s The Raft of the Medusa, 1824; John Singleton Copley’s Watson and the Shark, 1778; and Rembrandt’s Christ in the Storm on the Sea of Galilee, 1633. Eric Avery, Johnny Garrett is Dead, 1992. Woodcut on machine made Okawara paper. 36 x 48 inches. Edition: 10. Graphic Arts Collection GAX 2014- in process. Eric Avery, The Sleep of Reason from Behind, 1986. Linoleum block print on photo silkscreen on handmade mulberry paper. 34 x 25 inches. Edition: 10. Graphic Arts Collection GAX2014- in process. After: Francisco José de Goya y Lucientes, El sueño de la razón produce monstruos (The Sleep of Reason Produces Monsters), 1799. Eric Avery, Lifecycle of HIV Showing Sites of Actions of Medications, 1997. Linoleum block print on okawara paper. 72 x32½ inches. Edition: 20. Graphic Arts Collection GAX 2014- in process. 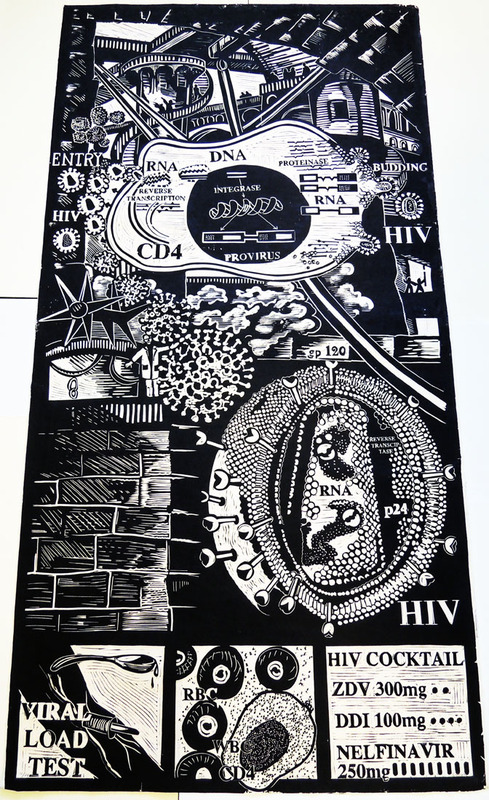 The Life Cycle of HIV was an art medicine action for 1997 World AIDS Day. 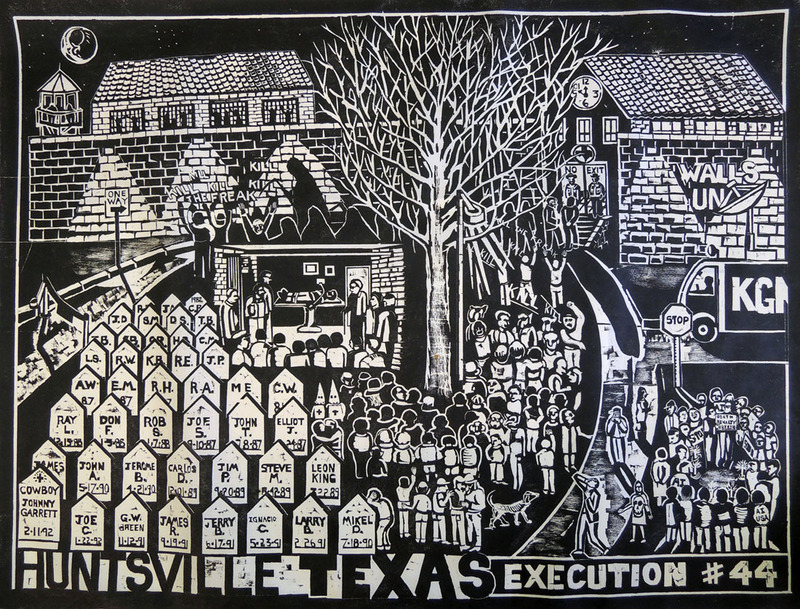 The print also appears on the back cover of Pictures That Give Hope, which was printed in large editions and used in a number of US prison systems. Emerging Infectious Diseases shows the vulnerable body infected by multi-drug resistant T.B., HIV, Hepatitis C and the very new United States infection West Nile Encephalitis.The print emerged after the West Nile Virus outbreak in NYC in 1999. This was the first time this virus was detected in the Western Hemisphere. The image source for this print is a rare French woodcut that accompanied the poem “La Complainte et Epitaph de feu Roy Charles” in Octovien Saint-Gelais (1468-1502), Le vergier d’honneur, nouvellement imprimé à Paris… [Paris, ca. 1500], unfortunately not in the Princeton University Library. “The sick man is attended by a physician, the man receiving spiritual consolation, the corpse being prepared for burial, and the well man, about to leave, receiving a word of advice from a physician in the background.” –Carl Zigrosser, Ars Medica, 1959. This entry was posted in Acquisitions, prints and drawings on October 1, 2014 by Julie Mellby.